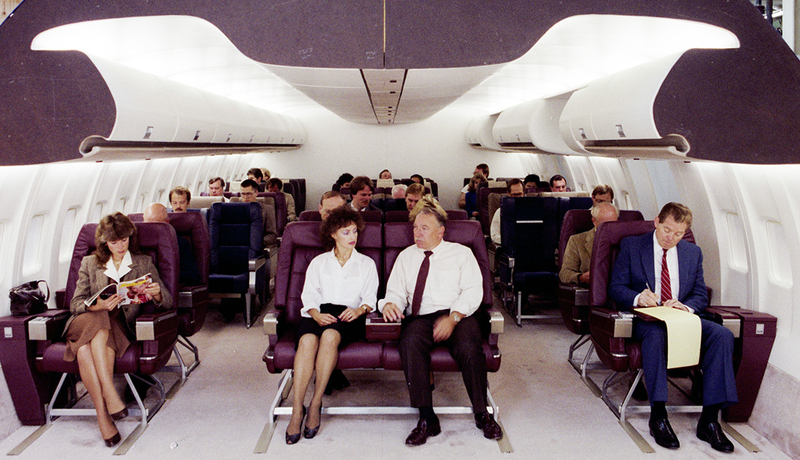 Cabin mock-up of the Boeing 7J7 of 1990, very similar to what the 797 will be like . However the 797 will have far more advanced overhead styling. Boeing says it is now set to make a final decision on whether to launch its new midsize airplane (NMA), dubbed the 797, in 2020. The company had previously indicated a decision would be made in 2019 but Boeing chief executive Dennis Muilenburg told its earnings conference this week that the decision this year would be whether to offer the plane to the market. Analysts increasingly believe the plane will get the green light and several had predicted it would happen this year. Muilenburg said the company had “very productive’’ conversations with customers and it was clear there was a market need. But he said it was still going through the details of the business case and it would be very disciplined on how it did that. The Boeing chief said that depending on the market response, it would make the final launch decision next year. He said the company’s assessment of the market size had not changed. “So it’s a two-step decision process as we’ve always done with Commercial Airplanes and a very disciplined process,’’ he said. READ will the next Boeing by a 797 or an 808? The NMA will be a competitor to the Airbus A321neo and expectations are it will be a composite plane featuring a more comfortable 2-3-2 seating layout with big overhead bins. Boeing has defined two versions – the NMA-6 (797-6) with 228-passenger, 4,500nm (8,300km) and the NMA-7 (797-7) which would seat 267 in two classes with 4,200nm range. Airbus already offers the A321LR, which can fly up to 4000nm (7400km) and carry up to 206 passengers in a typical two-class layout or 244 in a single-class configuration. The A321LR has a maximum takeoff weight 97 tonnes, compared to 93 tonnes for the standard A321neo, and Airbus estimates its per-seat operational cost is 30 percent lower than its nearest competitor. Qatar Airways announced this week it would add the Airbus A321LR to its fleet by converting 10 of its 50 Airbus A321neos to the long-range variant. It said it would use the plane to connect Doha to growing markets where demand was still insufficient to support widebody aircraft or destinations that were out of reach for its other single-aisle planes. It could also use the new aircraft to provide additional frequencies on existing s routes to give passengers more choice and flexibility, it said. “We have reassessed the requirements of our fleet and determined that the A321LR will bring the additional capability and range to our existing portfolio of aircraft types that we require to successfully support our global route expansion,’’ Qatar chief executive Akbar Al Baker said. The first A321LR will be delivered to Qatar in 2020.